Just an update on how I am doing with my annual Detoxification and Rejuvenation Program (DRP). I am now into my fifth day of Detoxification & Rejuvenation Program (DRP) today, I decided to do just 5 days this time, that means today is the last day of my Detox. One would ask whether I feel any difference after the fifth day of strict fruits & vegetable diet supplemented with vitamins in the package. I would say YES. I feel much lighter, not only slimmer, I also feel much relieve on the neck strain and headache problem that I have been suffering all this while, and I wake up more refreshing even with lesser hours of sleep. I am more at ease in following this program as compare to last year (which I completed the course of 7 days). Probably I know what to do and what to expect in this time round. Do I crave for food?? YES, definitely, but my will power is strong enough to resist those food placed in front of me while having dinners together with my family for the last 4 days. 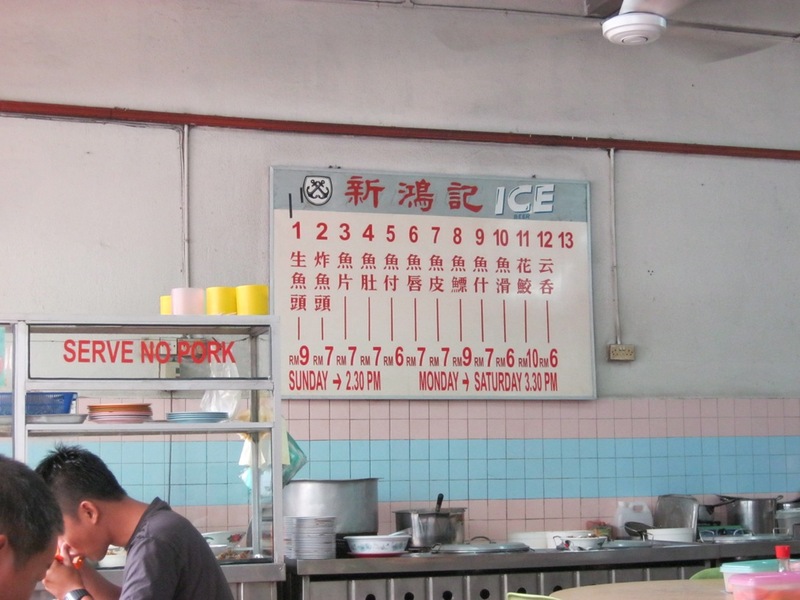 Craving for food is always the biggest challenge in carrying out the DRP. 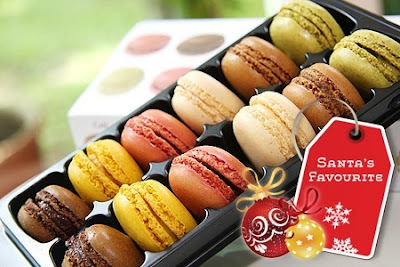 If you have gone through a strict diet like what I do, I am sure you will crave for your favourite food. 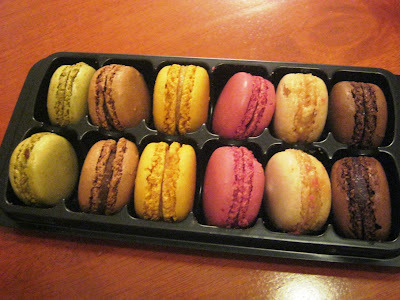 I can tell you that there is one food that I crave the most in these 5 days. 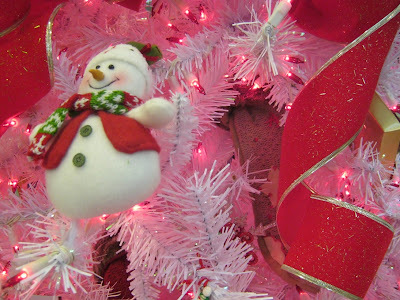 I have told my hubby and he will bring me there after I am done with my DRP, hopefully tomorrow. 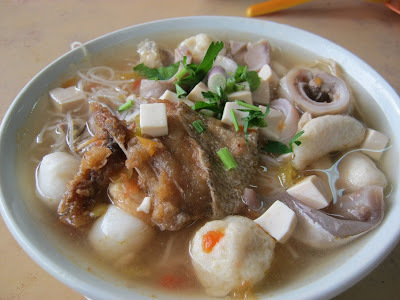 I am really craving for this Fish Soup with Rice Vermicelli that I used to have for breakfast at one of the famous eatery in town. Let me show you what I really craving to have…. Is this mixed fish meat and fish balls soup with rice vermicelli, dip with the mixture of light soy sauce, chillie padi and calamansi juice. 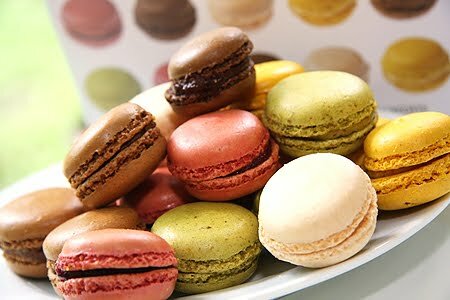 Yummy…I am droolling now!!!! My ex-colleague, Doris, invited us to join them to celebrate their new born baby girl, Micole's full moon party on 20th November. We have not been seeing each other ever since I resigned from the Stockbroking firm 4 years ago. I am really glad that she included me and my family in her invitees' list. She is as pretty as ever, only put on a little inches after giving birth. I also managed to catch up with my other ex colleagues, Vivien, June and Lesley in the party. Only in a party like this we are able to meet up with old time mates. As we are all having kids with the same age groups, our topics for the night were mostly about the affairs & happening around our kids, especially 3 of our kids are going to Primary one next year but at a different schools in town. Since it is still lunch hour. It's a good time to blog something about food. 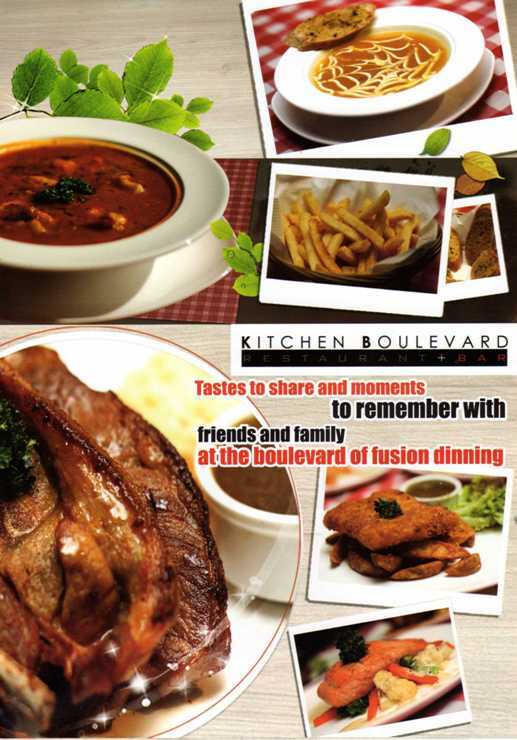 My colleague introduced to us, the Kitchen Boulevard Restaurant, with this leaflet. 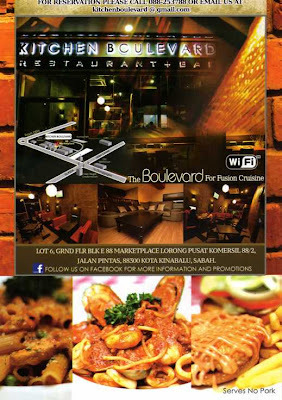 This restaurant is belongs to her friend, she has been there many times, she finds the food is good and the price is also reasonable. 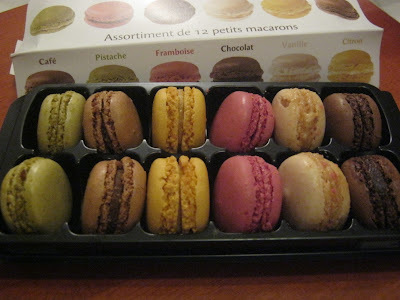 Me, as a food lover, who really like to eat, went to have a try on one of the Friday. 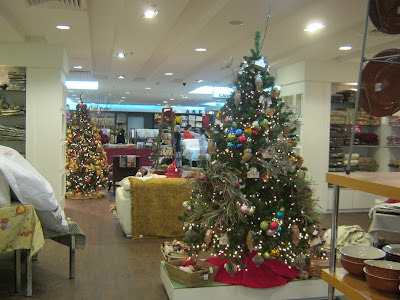 We were the first customers for that evening, it was raining and was only about 6pm. 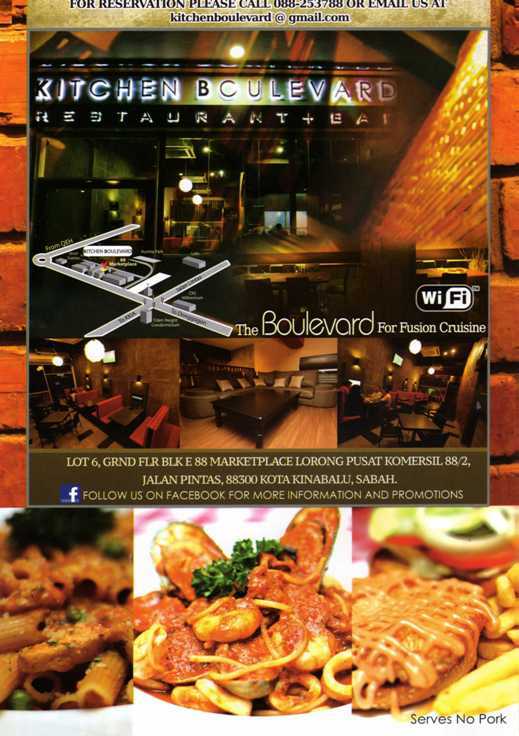 It is not a big restaurant, very cosy with wifi, there is an upper deck with sofa and dinner table for small private gathering purpose. playing games on the computer mounted next to the dining table. 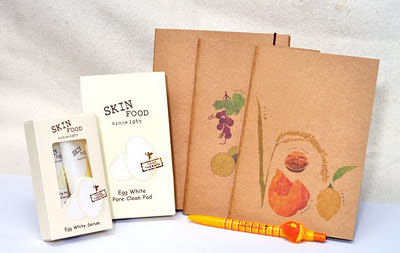 Good to have it as business presentation to 3 -4 persons. These were what we ordered from the menu, I did not take the photo of the brownie as I was busy eating when it is served. 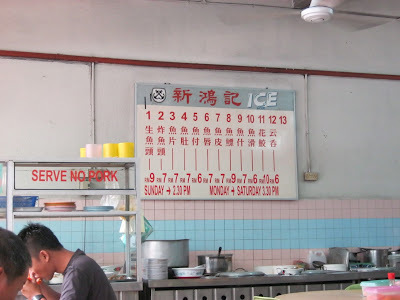 This of course is Clet's order, the lamb. He gave a thumb up for this. 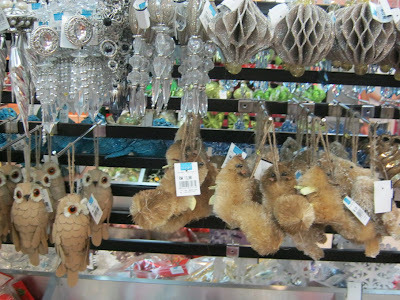 On once fine Sunday many weeks ago, we headed to Gaya Street to look for plants. The Moss Roses or 9 O'clock flowers are the ones that I was looking for, cheap and easy to grow, so long as there are water and sunshine. I managed to buy these bundles of mix colours Moss Roses for RM1-RM3 (USD0.32 - USD0.99) per bundle. The Moss Roses will grow easily and bloom in 1 - 2 weeks, this is what I like about these flowers, I have no time to take care of any flowers and plants. I only manage to have a glimpse of them during weekends and public holidays when I do not have to go to work. Because Moss Roses only open their beautiful petals from 9am or 10am and shy away around 3pm to 4pm, this is the time I am still at work. These are some of the beautiful Moses Roses or 9 O'clock flowers at our front porch that I captured on one of the weekend. very sharp leaves plants, I once asked my hubby whether this plant is suitable to be placed by the door, according to Feng Shui School of Taught, sharp edges items are not good for Feng Shui, what do you think??? These plants have more leaves than flowers, their leaves are of different colors, they are of same species...I think..?? November will soon be over, it's time to prepare for Christmas, the first thing to begin with the preparation is to put up the Christmas Trees, yes we have 2 Christmas Trees, 1 big and 1 small revolving Christmas Tree with lights. 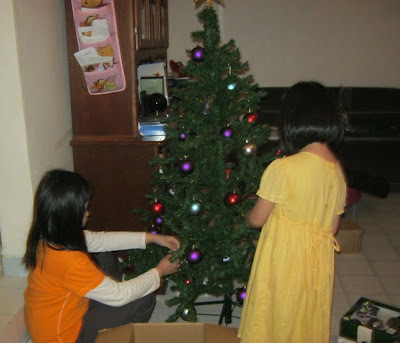 Our girls are ever so excited to put the ornaments on the Christmas tree. 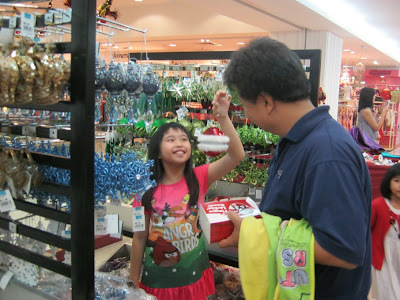 After attended our niece's abacus arithmetic competition at Suria Sabah this afternoon, we went into Metrojaya to have a look and feel the Christmas' atmosphere. They have put up a lot of very beautifully decorated Christmas trees at very departments and every aisles. 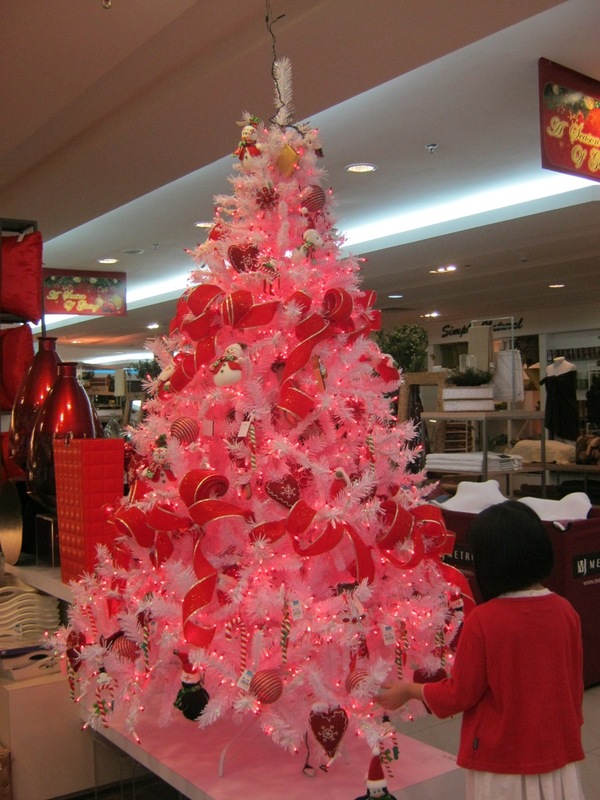 This red colour theme Christmas tree is our favourite. 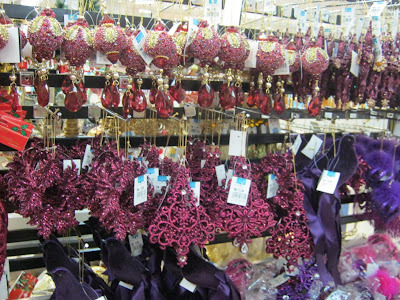 Ornaments have been put up for sales, many type of colours to choose from for you to decorate according to your Christmas colour theme this year. 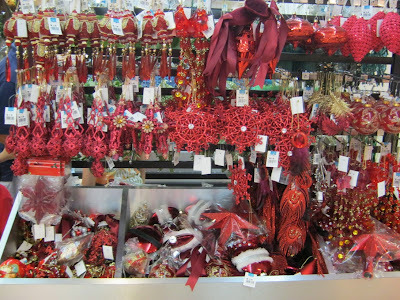 Since we have many of our Christmas decorations which we have been keeping for many years, we did not buy any as we have already have enough. Ladies, the sales are on at Metrojaya in KK, some items are up to 80% discounts. 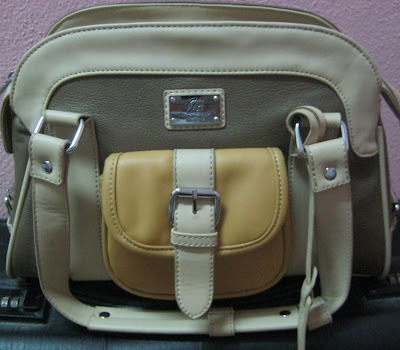 I desperately needed to change my handbag, after searching through the bundle of handbags, I managed to get myself a very reasonable price handbag, it is not Coach, definitely not LV for the moment..it is only a GF (Gio Fiore), at 70% discount. Can you guess how much it is??? 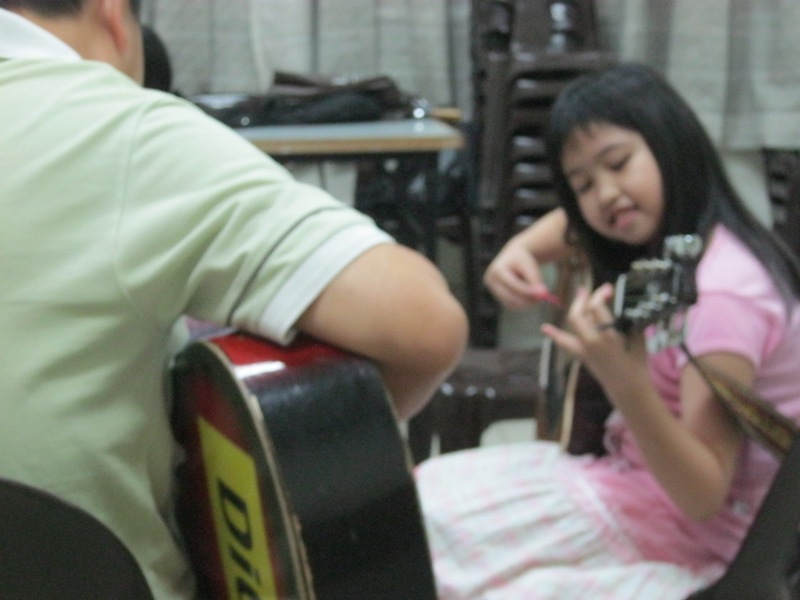 For the past 1.5 months, Crystal has been attending guitar classes at the church once a week. 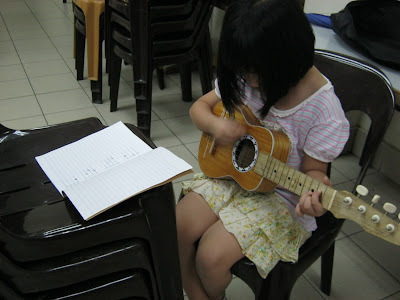 Pearl is able to join in the class after their daddy bought a ukulele for her from his trip to the Philippines 3 weeks ago. Both of them has shown some progress in their guitar playing skills after having their own guitars but still need a lot of practices before they can play smoothly. 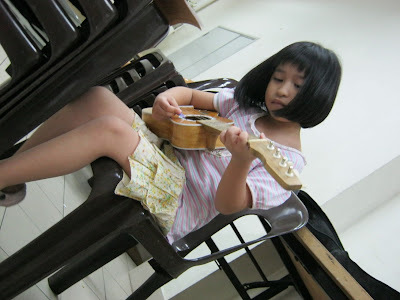 Interest in playing guitar play a major part, they seem to have the interest thus far and hope they could progress further and be good in playing guitar. I would love to see them playing their guitars and sing along soon. 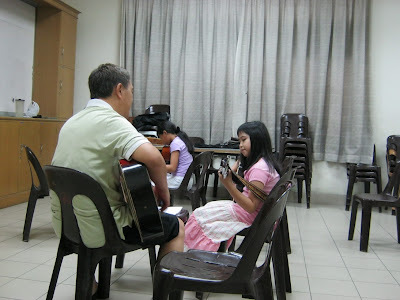 Thanks to Michael, our church member, in sacrificing his time for the free guitar lessons every week. With all the Angry Birds waves in town, I couldn't help but to buy 2 pretty angry Birds' dresses for my 2 little princesses. 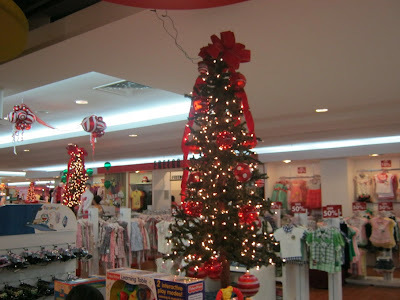 In fact, they never asked for any Angry Birds' goodies, not a big fan of Angry Birds as they do to Barbie and Bratz. Though they are not a big fans of Angry Birds, because of the waves are so strong that they have received many birthday presents and gifts featuring Angry Birds. 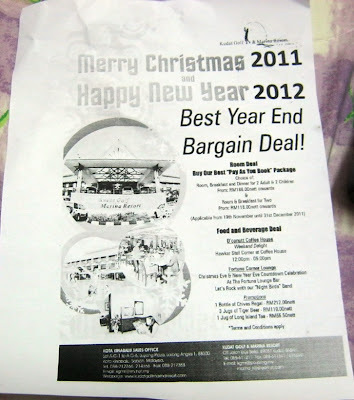 The Kudat Golf & Marina Resort's Best Year End Bargain Deal! Frankly I do not like people put any advertisement materials on my car, I hated it most when I was in a hurry and realize a piece of paper stuck in front of my windscreen when I was about to go, need to come out from my car again and take it away again. This piece of paper was stuck at my car wiper this afternoon when I was off for my lunch break. Like always, I quickly take it away and squeeze it like another piece of waste paper. While waiting at the traffic light, curiously I reached out to this paper to find out what it is all about before I throw it away. 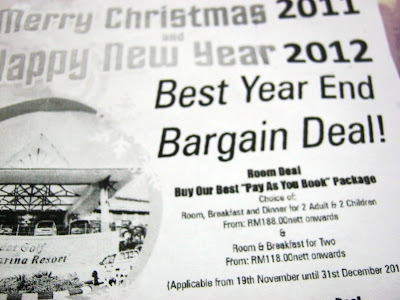 Interestingly it is a flyer about room promotion Best year End Bargain Deal at Kudat Golf & Marina Resort, I have been to Kudat several time mostly on day trips and never have the chance to stay at this resort. The package is pretty attractive. The Room Deal "Pay As You Book" package is at RM188 nett onwards for 2 Adults & 2 children with room, breakfast and dinner provided or you could choose a room for 2 at RM118.00 nett onwards for room and breakfast for 2. If you plan for a Cuti Cuti Malaysia, Kudat is a place of visit to consider for a short stay trip this school holiday, it is about 3 - 3.5 hours drive from Kota Kinabalu. You could also visit The Tip of Borneo at the same time, it is situated at Tanjung Simpang Mengayau, the northern most tip of Borneo. I have been there once and do not mind having another visit there again. 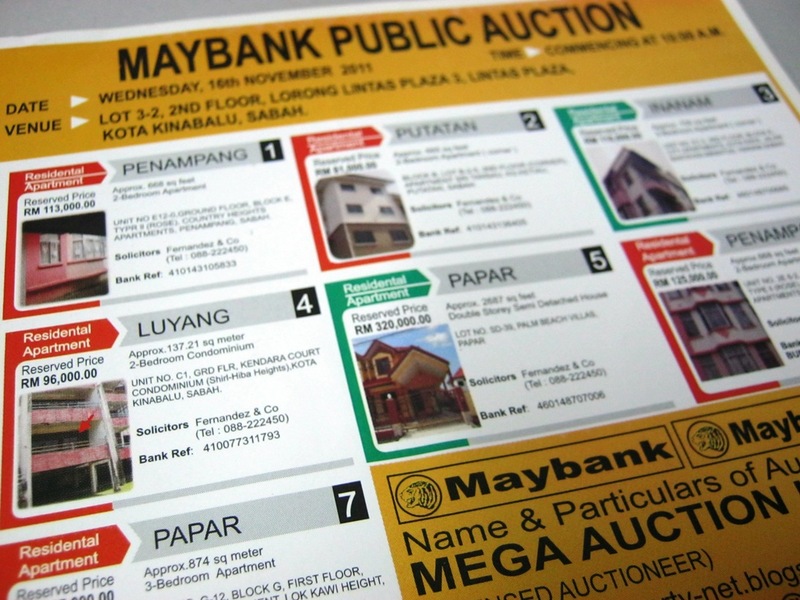 Today, Clet conducted the property auction sales for Maybank. 7 properties up for sales, 2 were cancelled last minute (glad that the house owners managed to update their payments), leaving 5 for auction, at the end of the day 2 properties were sold. Actually this cage was bought more than a month ago, I just haven't got the chance to post it here. 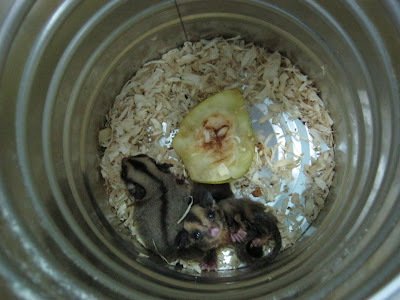 We supposed to have a pair of hamster, the female one has escaped (set herself free) and never returned, leaving the male one all alone. 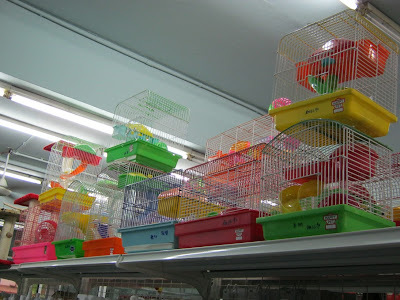 It's growing day by day, the small baby hamster cage no longer provide a comfortable space for him to walk, limited space has deterred his movement. 1 day, when feeding him, I noticed that it is limping, one of his leg has turned black. I quickly moved him to a bigger storage container and left him there for a day or two to observe. With more space to move around, his leg has thus recovered. 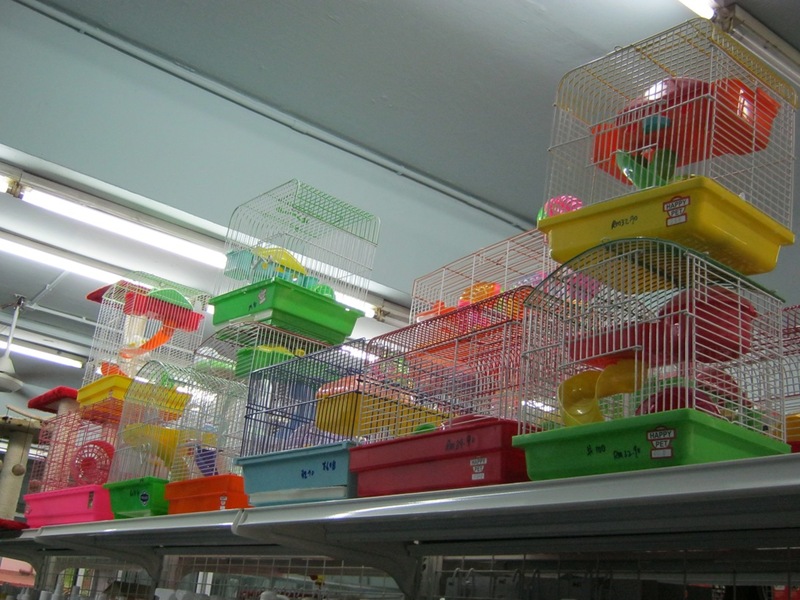 We have no choice but to look for a bigger cage to house him so that he can grow healthily. 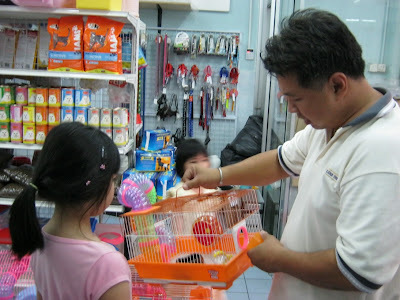 We checked a number of pet shops around town in order to get a nice cage with reasonable price. 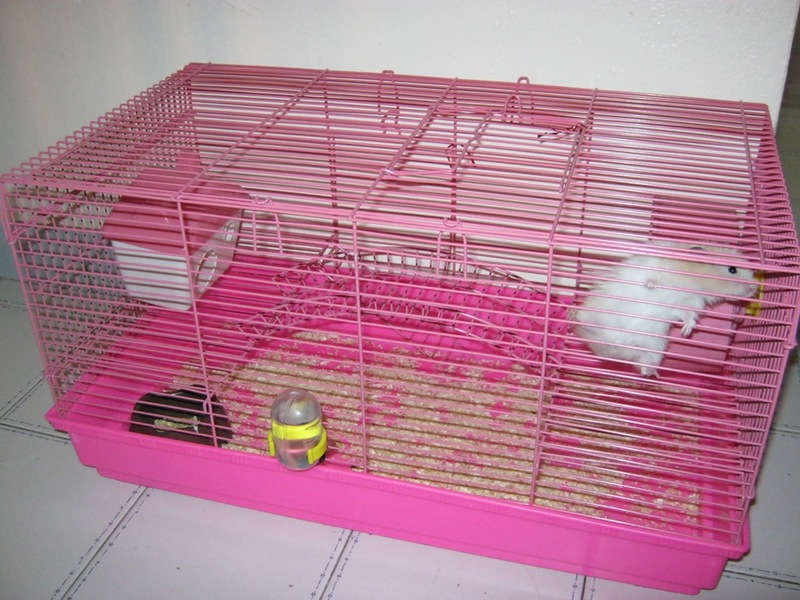 With few choices to choose within our budget at one of the Pet Shop at Bornion Centre, we finally decided to buy a big pink cage. 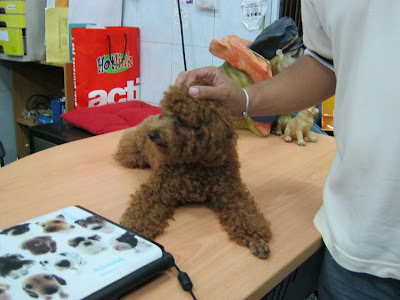 In the same shop, we saw a very cute and well behaved Poodle, he just sits and walks around the table with no fuss. 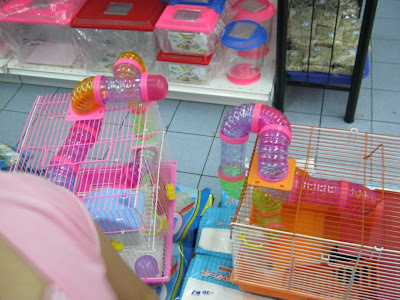 There the owner of the shop also showed us the new pet in town, an animal size slightly bigger than the hamster, look like squirrel but slow in movement, forgot what's the name of this animal. But it's not the kind of pet for us. 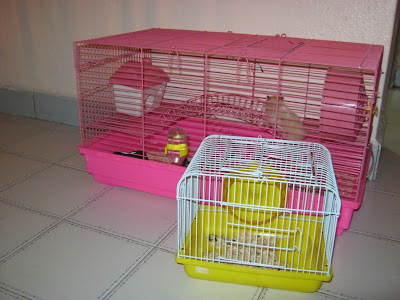 Just to show the baby cage that house the hamster before and the new big pink cage.